How would you like to turn your visit to Hawaii into a way to help the environment?! How about the opportunity to leave Hawaii a little better than you found it? Well, if you’re environmentally-minded, you have the chance to leave your mark on Maui, thanks to a program called Volunteering on Vacation by the Pacific Whale Foundation. In the company of a Pacific Whale Foundation group leader, you’ll gain free entrance to beautiful Haleakala National Park and learn about the history of this spectacular wilderness area. At the park, you’ll help remove invasive plants from the National Park. Free transportation is provided, from Pacific Whale Foundation’s Ocean Store in Maalaea (meet at 7:30 a.m.) and the Tavares Community Center in Pukalani (meet at 8:15 a.m.). The program takes place from 9:00 a.m. to 2:00 p.m. and includes three hours of work, plus time for a short hike and picnic. Bring water, snacks, lunch and sunscreen and wear closed-toe shoes, pants and warm clothes. Be sure to call 249-8811 in advance to sign up! With partner South Maui Volunteers and group leaders Bob & Lisa Richardson, you’ll help maintain a new oceanside trail, pick up litter and remove invasive species. This beautiful coastal area is great for birdwatching! Meet at 7:30 a.m. in South Kihei. The program takes place from 7:30 a.m. to 9:30 a.m. and includes two hours of work. Bring water, snacks and sunscreen and wear solid, closed-toe shoes and pants. Be sure to call 249-8811 in advance to sign up! Volunteer opportunies provide access to many inaccessible locations like the Waihee Refuge on Maui. Work on the exquisite Oo Farm in the Waipoli rainforest in Kula. You’ll help with assorted farm chores on this unique and innovative 8.5 acre organic farm. Meet a Pacific Whale Foundation representative at the Pukalani Community Center at 8:45 on Wednesday mornings to caravan up to the farm site in Kula. Project work lasts from 8:45 until 11:30. Be sure to wear sturdy shoes and bring a light jacket that you do not mind getting a little dirty, as well as water and sunscreen. Gloves and gardening tools are provided. For information or to sign up call (808) 249-8811 ext. 1. With partner Maui Coastal Land Trust and group leader Scott Fisher, you’ll visit a remarkable coastal area that’s rich in Hawaiian history and bird watching. And it’s home to some of Maui’s last sand dunes. You’ll help to remove invasive species, clear brush and weed. Meet at 8:00 a.m at green caretaker’s house at the the Waihee Refuge. From Wailuku, head out Kahekili Highway to Waihee, and turn right on Halewaiu Road. At the bottom of the hill turn left onto the dirt road, and take a left through the inner gate at the beach parking lot. The program takes place from 8:00 a.m. to noon and includes four hours of work. Bring water, snacks, lunch, and sunscreen, and wear closed-toe shoes, pants and hat/sun protection. Be sure to call 249-8811 in advance to sign up! With partner Malama Honokowai, visit Honokowai Valley, which is closed to the public. Help save archeological sites of old Hawai’i, pull invasive plants and possibly plant native species. Meet at the North Sugar Cane Train Station in Ka’anapali at 9 a.m. You will return no later than 5 p.m. Wear sturdy shoes and bring lunch, water, snacks and sun protection. Be sure to call 249-8811 in advance to sign up! Join Friends of Hookipa to restore and protect Hookipa Beach Park on Maui’s North Shore, world famous for its extraordinary surfing and wind surfing. Remove invasive plant species and plant natives species. Meet at the Hookipa Beach Park overlook parking lot at 8:00 a.m. The program takes place from 8:00 a.m. to 11:00 a.m. Hang out after volunteering and enjoy free pizza for all volunteers at noon! Wear long pants, closed-toed shoes, and bring water, snacks and sun protection. Be sure to call 249-8811 in advance to sign up! 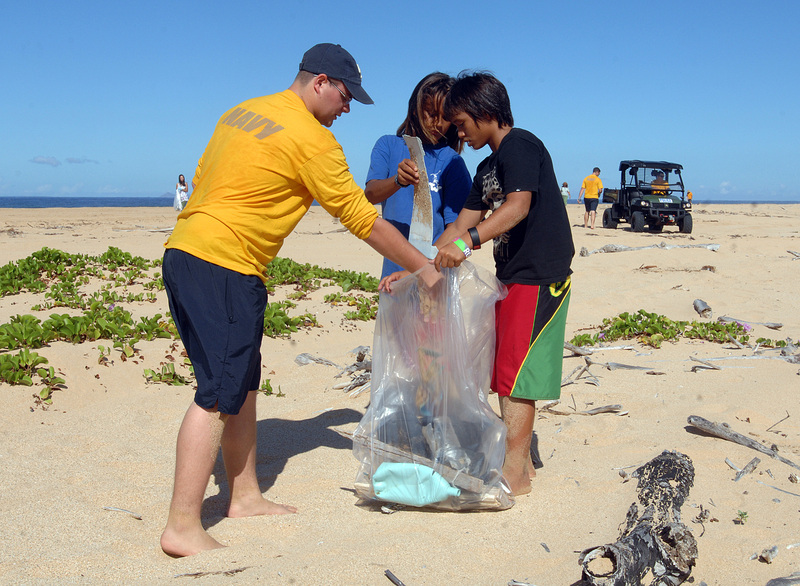 Hawaii beaches are always in need of a helping hand or two to remove trash. Pick one of your favorite beaches, pick up our free “beach clean-up kit” and go to work! You’ll help protect wildlife by preventing litter from entering the ocean. And everyone will appreciate your efforts to keep Maui’s beaches beautiful. Trash bags, gloves and instructions are provided. To arrange for pick-up of your beach clean-up kit, call 249-8811. If you book a Haleakala Sunrise Tour through Hawaii Aloha Travel during your visit to Hawaii, consult with your guide about how YOU can help the environment during your trip to the summit. Our guides are always flexible and knowledgeable about Maui’s environment and ways you can help! On your next trip to Maui, leave with more than just a good tan — leave with the knowledge you’ve helped out!